We went to the Hunter-Gatherer Thursday night, and even if you read this post days/weeks/months from now, we will still be thinking about the Chicken Ravioli. For those of you who aren’t familiar with H-G, this Columbia establishment has been brewing and serving their own “English-style ales” since 1995. They also know how to cook. The kitchen opens at 11:30am Tuesday-Friday and 4:00pm Monday and Saturday, and offers a standard menu that you can find everyday (including the Smoked Chicken Ravioli) and an ever-changing selection of 3-6 daily specials. With half of our pints of Hunter-Gatherer IPA and pale ale already gone, we finally spotted a table opening up and briskly navigated from the bar to the table for the always difficult task of picking an entree. We eventually settled on the “Smoked Chicken Ravioli” and the “Crab Cake Sandwich” and sat back to enjoy the rest of our brew and wait with impatient stomachs. Once our order was in, it didn’t take long for our meal to come out. We all know that beautiful moment when you spot the waitress approaching your table with your meal. Almost as good as coming back from the johnny and finding your meal waiting on you. The star of our meal was the Smoked Chicken Ravioli in a gouda cream sauce. Its going to be really tough to branch out on our next trip to the Hunter-Gatherer. 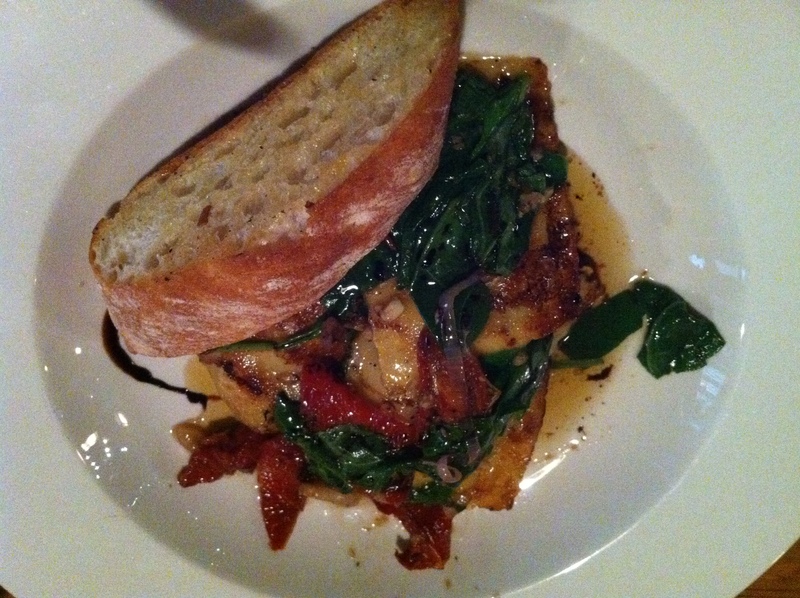 The ravioli, accompanied by spinach and grape tomatoes, was bathing in an indescribably good sauce. After vacuuming up the ravioli, the crusty piece of bread served as the perfect medium to sop up the rest of this liquid deliciousness. The ravioli came with a side salad composed of fresh greens and a lemon vinaigrette. Its hard to compete with the ravioli, but the crab cakes were a close second. 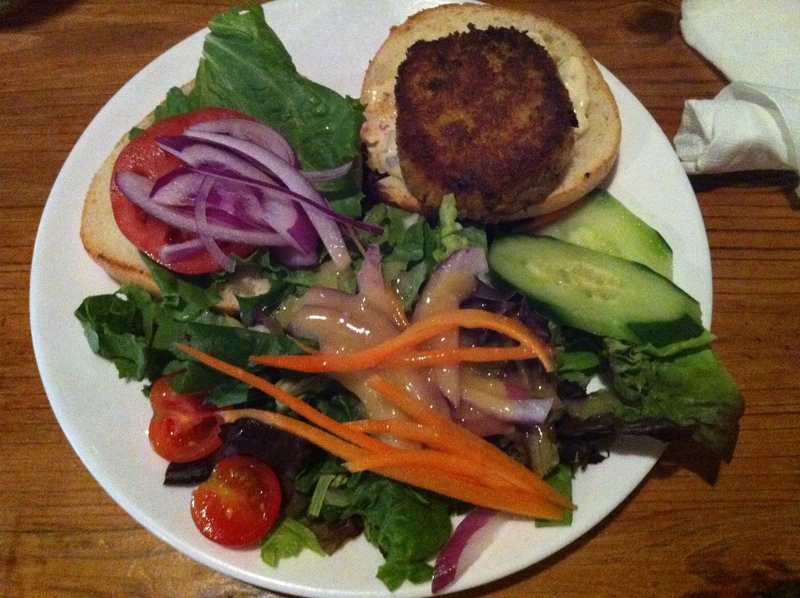 The “Crab Cake Sandwich” was made with Virginia crab meat and served with a roasted red pepper remoulade and lettuce, tomatoes, and onions. The sandwich was served with a fresh side salad topped with the house vinaigrette. Located on Main St, behind the State House, the Hunter-Gatherer has a very rustic low-key atmosphere going for it. The heart of the Hunter-Gatherer is their brewing vats surrounded by a large wooden bar, which separates friendly bartenders from thirsty patrons. The building itself is unique, a square brick structure with decorations ranging from christmas lights and tribal shields to a stuffed hyaena. Large chalkboards with tasty descriptions of the daily specials add a nice touch. Additional seating can be found outside or on the upstairs loft. Be sure to join them on Thursday evenings from 8pm to Midnight for live jazz organized by Columbia’s own Skip Pearson! Sit back and enjoy some great food, drink, music, and company. The Hunter Gatherer is a true gem among Columbia, SC restaurants.